Now and again through the evening calm comes the sound of a powerful petrol motor, and soon afterwards the streets are filled with a thick, grey, pungent cloud. This is insecticide, and they are fumigating against Aedes mosquitoes, principally Aedes aegypti but also increasingly Aedes albopictus. Aedes are one of the banes of mankind, in many ways, but the worry here is Dengue fever. Dengue, or "breakbone" fever causes fever (clearly), muscle pains and, in a small % of cases, internal hemorrhaging and death. Brazil has by far the highest numbers of Dengue cases in the world, 936,000 confirmed cases in 2010 out of 1,785,059 worldwide (52%) and 592 deaths out of 2,398. This year Rio de Janeiro alone had 31,176 registered cases up to April 7th, and 6 deaths. There is as yet no vaccine against Dengue, although progress is being made. Just this year the results came in of a four year Brazilian study in which 180 volunteers were vaccinated, and 95% produced sufficient antibodies for immunity. This study has been increased to 800 people, and eventually there will be a full scale clinical trial of 20,000 people throughout Latin America. 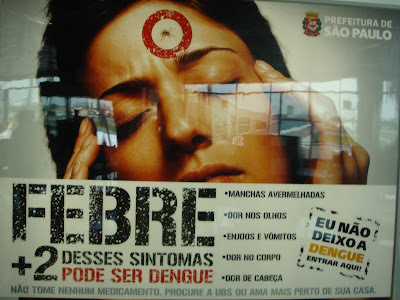 You can´t catch Dengue by shaking hands, or sneezing or eating the wrong food, it has to be transmitted blood to blood, which in practice means the bite of a female mosquito. Dengue prevention measures mean mosquito prevention measures. 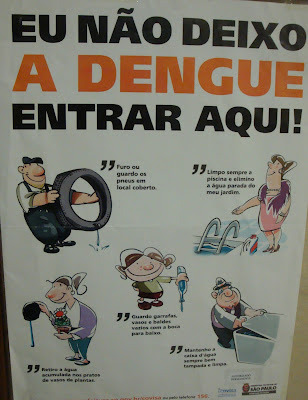 Public health varies from city to city, but as an example, this is the situation in Vitoria (Pop. 330,500) in the state of Espirito Santo. i) Mosquitoes can breed in any little pot of dirty water. Shops and businesses are regularly monitored to ensure there are no possible breeding sites, especially trucking and type recycling companies as tyres are notorious breeding grounds for Aedes aegypti. Failure of an inspection can result in a R$2000 fine and persistent offenders can be closed down. Vitoria has 250 inspectors for Dengue and other diseases. This is backed up by a regular television campaign aimed at households. ii) Mosquito numbers are monitored using 35 traps around the city which both collect adults and have a space for eggs to be laid. iii) The above mentioned insecticide "foggers" operate 120 hours per month. Additionally 22,800 manholes and culverts are treated with larvicide each week. iv) Staff education courses and workshops. This sounds impressive, but there are problems. The most important is probably the issue of breeding sites. Urban areas are dotted with building sites and waste ground and Aedes aegypti only needs a rain filled puddle. It doesn´t even have to be clean puddle, they can tolerate oily, polluted or even slightly brackish water. 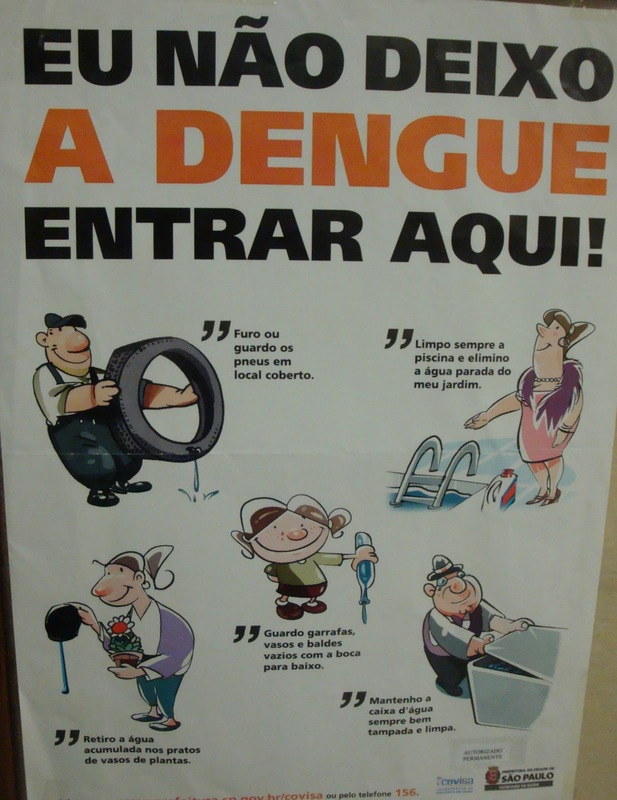 A survey of workers at a rubbish tip in Rio found 23% had had Dengue. 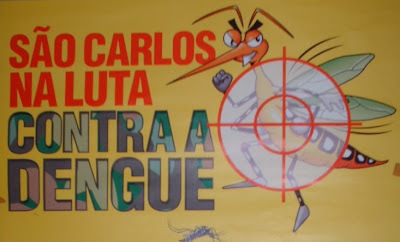 And in Brazilian temperatures mosquitoes develop very quickly, the time from egg to adult is only 10 days at 30 C. Cases of Dengue peak from December to May, the months of hottest temperatures. The situation in the countryside is different, as Aedes aegypti tends to be a city mosquito, and larvae are snapped up by fish in lakes and ponds. But there are still plenty of holes and puddles, and the bromeliads common to the Mata Atlantica region provide perfect, safe, breeding sites. Also, various native mammals seem to be host to the Dengue virus, though not as many as in other continents as Dengue is not native to South America. Nonetheless, scientists in neighbouring French Guyana have found the virus in rodents, opossums and bats, which suggests that it is adapting. It has also been found in the forest mosquito, Haemagogus leucocelaenus. In other words, you could completely sterilise a city of mosquitoes, and the Dengue virus would still survive in the countryside, ready to return. The only long term hope is a vaccine. Very nice article. Do houses/offices in Vitoria have insect screen in doors and windows? Dengue mosquitoes are know to be active during day, which indicate that mosquitoe nets might not be effective. Any thoughts on this? Thank you both, I have tried to capture some of the posters I've seen around. Regarding nets and screens, they are not as common as you might think, in fact quite rare. Plug-in-the-wall repellents are widely available in supermarkets, or insecticide sprays, but not nets.